Des Moines Public Schools held its 11th annual district science fair on February 7th at the Science Center of Iowa. More than 185 students in grades 6-12 presented their research to volunteer judges representing area corporations, higher education, and DMPS science faculty. 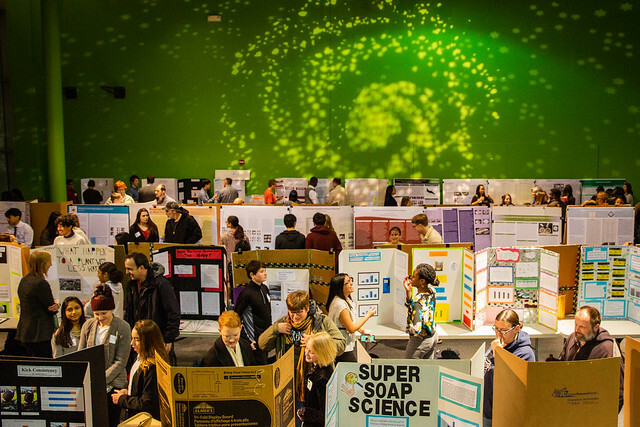 The event never fails to inspire projects as variant as the interests of 6th graders versus 12th graders, from the poppiest popcorn brands to experiments with artificial selection in the development of antibiotic resistance (!). One trait common across that age range is an inclination to experiment. Listed below are the best of this year’s batch of experimenters. Winners advance to the state science fair on March 28-29 at Iowa State University in Ames.